Faye Wong Performs on 18 May 2008! Faye Wong (王菲) performs for the first time in three years! In this 18 May 2008 video, Faye joins Faith Yang (Yang Nai Wen, 杨乃文), Eason Chan (Chen Yi Xun, 陈奕迅), and Aniu (阿牛) in “Wishing We Last Forever.” This is a monumental performance, bringing the most celebrated Chinese singer of all time back to the stage. Her managers claim that this is not to be taken as a sign that she’s returning. They insist that Faye is doing this for the sole purpose of helping the earthquake relief effort. But fans can’t help but get their hopes up that this is the first step in her return. Faye looks fabulous, as always, even when she’s dressed in simple, everyday clothes. ADDED: I’m so glad Faye led off with a solo. Her voice is pristine, as beautiful as it’s always been, despite the long layoff. When she sings with others, we realize that she is one of the few whose live performances are just as good as her studio recordings. Welcome back, Faye, even if it’s for just this one performance. What an amazing treat, and what a tribute to the 29-50 thousand who perished in the May 12 earthquake in Sichuan. ADDED 5/19: The program, which was broadcast live from Beijing, began at 8PM and lasted 4 hours. According to Ent.163.com, the audience had to wait until 11:30PM to finally see Faye. Apparently, the producers understood Faye’s drawing power and shrewdly made the most of it by scheduling her performance toward the very end, forcing the audience to stay tuned the whole time just so they wouldn’t miss her. But the wait was worth it, with Faye filling the screen with five minutes that shook the entertainment world. ADDED 5/19: According to News.hexun.com (20 May 2008), a website that provided a video of Faye’s segment of the show immediately after it aired had 10,000 hits in a very short period of time. ADDED 5/19: According to Enjoy.eastday.com (20 May 2008), when Katie was asked whether Nic and Faye had a chance to talk, she said no, that they didn’t see each other because they were with their own groups in separate parts of the building. 2. Alternate video – skips some of the introduction (05:30). ADDED: Photos from the rehearsal. ADDED: 19 May 2008 Sohu news video. 3. This 1995 performance has to be one of the most touching I’ve ever seen, Faye Wong (王菲) singing the Teresa Teng (鄧麗君, Deng Lijun) classic, “I Only Care About You” (我只在乎你). (Click on the image below to see the video.) This is a tribute to Teresa, who passed away earlier that year. Faye idolized Teresa and counts her as an influence. Teresa dominated the Asia pop music scene in the decades before Faye’s emergence. In July, a couple of months after Teresa’s death, Faye released an album, The Decadent Sound of Faye, devoted to covers of Teresa’s songs. ”Decadent” is a reference to the labeling of Teresa’s songs by the mainland’s cultural police. Teresa was a Taiwan native. [Added 5.26.08:] Some criticized Faye for capitalizing on Teresa’s untimely death. However, this album had been in production prior to her passing. Thus, the timing of the release was coincidental. Teresa’s mother appears in the opening, thanking those who have contributed to this program, including Faye. The erhu (二胡), a Chinese violin, is the instrument that, together with Faye’s performance, tugs at the heartstrings. In the segment before Faye’s appearance, the erhu is playing “Wishing We Last Forever” (但愿人长久), a Teresa song that Faye adopted as her trademark. The lyrics are from a poem written by Su Shi (苏轼) in the 11th century. The sound quality of the video could be better (the piano’s way too loud), but the poor engineering doesn’t lessen the impact. 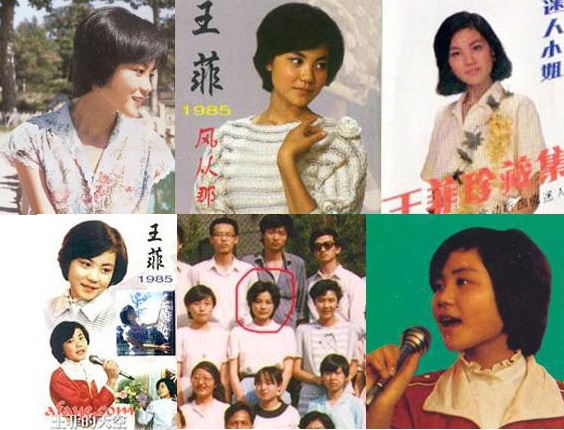 Which One Is Faye Wong at 16? Kojifong’s been uploading some of the best Faye Wong (王菲) videos for a while now, and this one’s fascinating. He claims that Faye is in this video, which was made 22 years ago, making Faye about 16 years old. Click on the group image below to see the video. Can you identify Faye? I tried, and after numerous viewings, I’m not sure if I can. Agamjl, in his comment, says Faye is in the 01:52-01:57 segment. The girl’s tall, but I don’t think she’s Faye. The person closest to what I think Faye must’ve looked like at 16 is in the 07:16-07:20 segment. But I wouldn’t bet money on it. Here’s a collection of photos of Faye when she was 16, give or take. She’s obviously a little younger in the photos where she’s wearing red. Here’s a screen shot of my best guess (left) and Agamjl’s.